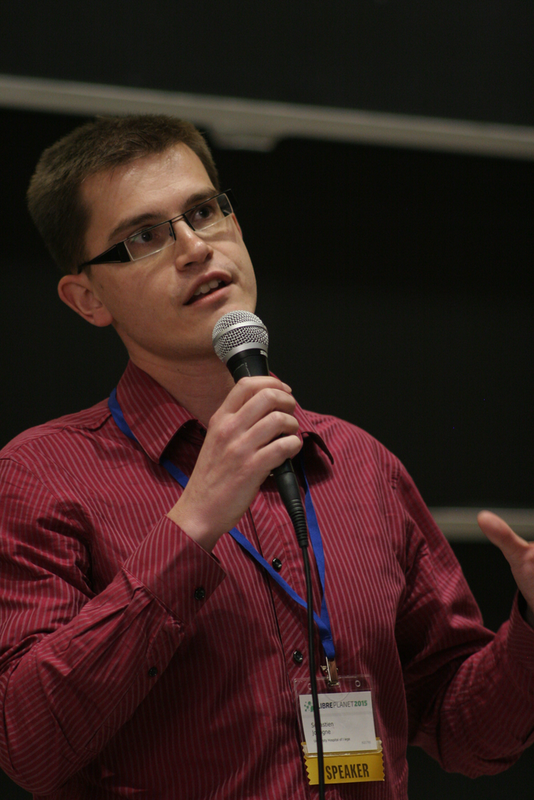 This year, it was given to Sébastien Jodogne for his work on free software medical imaging with his project Orthanc. One of Jodogne's nominators said, "The Orthanc project started in 2011, when Sébastien noticed in his work as a medical imaging engineer that hospitals are very exposed to lock-in problems when dealing with their medical imaging flows....Freely creating electronic gateways between imaging modalities (autorouting), between medical departments, or even between hospitals remains a challenging task. But the amount of medical images that are generated, analyzed, and exchanged by hospitals is dramatically increasing. Medical imaging is indeed the first step to the treatment of more and more illnesses, such as cancers or cardiovascular diseases." Jodogne said, "Technology and humanism are often opposed. This is especially true in the healthcare sector, where many people fear that technological progress will dehumanize the treatments and will reduce the patients to statistical objects. I am convinced that the continuous rising of free software is a huge opportunity for the patients to regain control of their personal health, as well as for the hospitals to provide more competitive, personalized treatments by improving the interoperability between medical devices. By guaranteeing the freedoms of the users, free software can definitely bring back together computers and human beings." Jodogne joins a distinguished list of previous winners, including the 2013 winner, Matthew Garrett. The Award for Projects of Social Benefit is presented to a project or team responsible for applying free software, or the ideas of the free software movement, in a project that intentionally and significantly benefits society in other aspects of life. 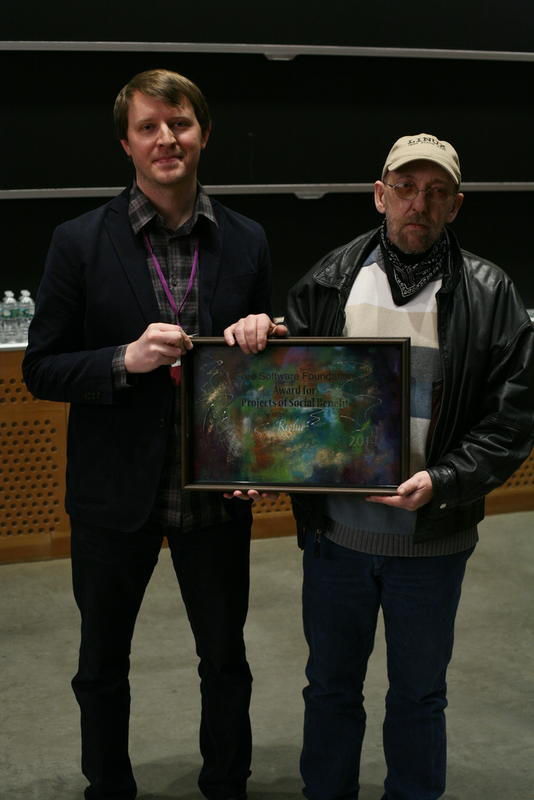 This award stresses the use of free software in the service of humanity. This year, the award went to Reglue, which gives GNU/Linux computers to underprivileged children and their families in Austin, TX. According to Reglue, Austin has an estimated 5,000 school-age children who cannot afford a computer or Internet access. Since 2005, Reglue has given over 1,100 computers to these children and their families. Reglue's strategy diverts computers from the waste stream, gives them new life with free software, and puts them in the hands of people who need these machines to advance their education and gain access to the Internet. One nomination for Reglue read, "Mr. Starks has dedicated his life to distributing free software in many forms, both the digital form...and by building new computers from old parts, giving a new life to old machines by re-purposing them into computers given to extremely needy children and families. They are always loaded with free, GNU/Linux software, from the OS up." Ken Starks, founder of Reglue, was present at the ceremony to accept the award. While all free 'as in freedom' software is not free of charge, Reglue focuses on finding empowering free software that is also gratis. He said of his work with Reglue, "A child's exposure to technology should never be predicated on the ability to afford it. Few things will eclipse the achievements wrought as a direct result of placing technology into the hands of tomorrow." Nominations for both awards are submitted by members of the public, then evaluated by an award committee composed of previous winners and FSF founder and president Richard Stallman. This year's award committee was: Hong Feng, Marina Zhurakhinskaya, Yukihiro Matsumoto, Matthew Garrett, Suresh Ramasubramanian, Fernanda Weiden, Jonas Öberg, Wietse Venema, and Vernor Vinge.